3D turn table kits for evidence photography and crime scene 360 X 360 homicide recreation. Nikon D3100 Camera. 14.1 megapixels. One shot optic, lens, software and ball head. Just add your Nikon or Canon SLR camera. Platter and RD8 Rotator unit. Supports up to 40 lbs. Create crime scenes on VPiX then download and burn to CD-ROM. VPiX CSI:360 servers available that you can host at your location. Call us for a confidential quote. virtual tour software virtual tour software Virtual Tours Now Widely Used in Crime Scenes. Even the CSI TV Show. VPiX™'s Tactical 360 kit was used in an episode of the hit CSI TV show; "Buyer Beware." The virtual tour kit was used to take a before / after 360 panoramic view of a home showing (then not showing) a valuable piece of modern art. In real life, the Tactical 360 kit is a point and shoot camera and the one shot panoramic lens. It has been upgraded to withstand years of punishing abuse. The mirror is no longer made of glass. It is now made of aircraft grade, polished aluminum and is 90mm (almost 4 inches across). Did you know: The Tactical 360 is used by the VA police department to photo document schools for Homeland Security. VPiX™'s CSI:360 software and our Tactical 360 camera kits allow officers, SWAT or CERT teams the ability to see the inside of any school or public building. Active shooting incidents such as the recent Arizona shooting, Columbine or Virginia Tech are tragic yet are increasing in frequency. Channel 8 News takes a look at how local law enforcement in Idaho is using VPiX™'s CSI:360 technology to help officers and CERT teams as a new tool to help save lives. 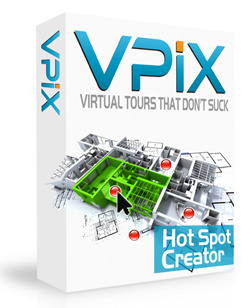 Click on any image above to view the VPiX HD Tour. VPiX CSI:360 Crime Scene Software is Now Available. VPiX™ has worked with police departments to design and develop crime scene re-creation software that will help you put more bad guys behind bars a lot faster. Below is a mock crime scene created using the CSI:360 CD-ROM templates and VPiX HD Tour Manager. With just a few mouse clicks, any rank and file police officer or CSU technician can re-recreate crime scenes in HD 360 and add Google GPS maps, slide shows and field notes. CSI:360 and the VPiX HD system is only available to law enforcement agencies and is available in several configurations. You can create your crime scenes online securely, then download them and burn them to a CD-ROM and give to the DA's office. Or, you can download them and use them on your own servers including intranets. CSI:360 is a perfect crime scene software tool that is now widely used by many law enforcement agencies. Contact us for a FREE demonstration or a quote.